A deploying Marine is trained to expect the unexpected. That’s fine — but it’s still frustrating when it comes because of incompetence. 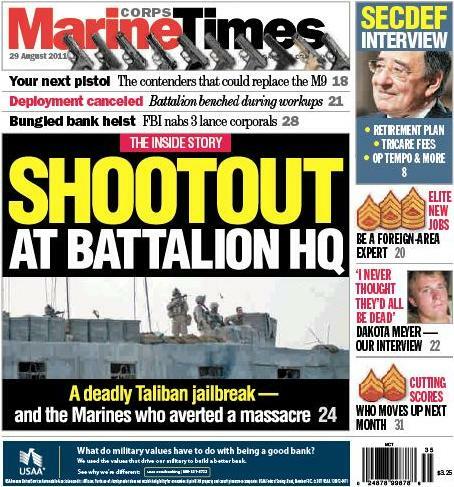 This week’s Marine Corps Times cover story takes a look at a deadly firefight aboard Musa Qala District Center, a forward operating base that served as the battalion headquarters last year of 1st Battalion, 2nd Marines, out of Camp Lejeune, N.C.
Marines with 1/2 found themselves in an unusual situation on Aug. 7, 2010 — fighting an insurgent loose on the base. He’d busted loose from a detention center on base run by the Afghan National Police. This incident has been covered broadly before, but using interviews and documents obtained through the Freedom of Information Act, I painted a much more detailed account of what occurred. It’s an eye-opening story, considering the relatively safety that is supposed to be offered inside the wire. To add additional perspective, Marine Corps Times also obtained and published exclusive photos taken on base that day during the fight. As you can see in the cover image above, they certainly show things weren’t normal that day. This week’s paper also includes a story drawn from an interview with Defense Secretary Leon Panetta and a look at pistols that could replace the M9 and M9A1 in the Marine Corps and Army. To read more, check out the newspaper on newsstands or subscribe online today.